Over the last decade, Slovakia has become an alluring destination for investors, mainly of the foreign automotive kind. 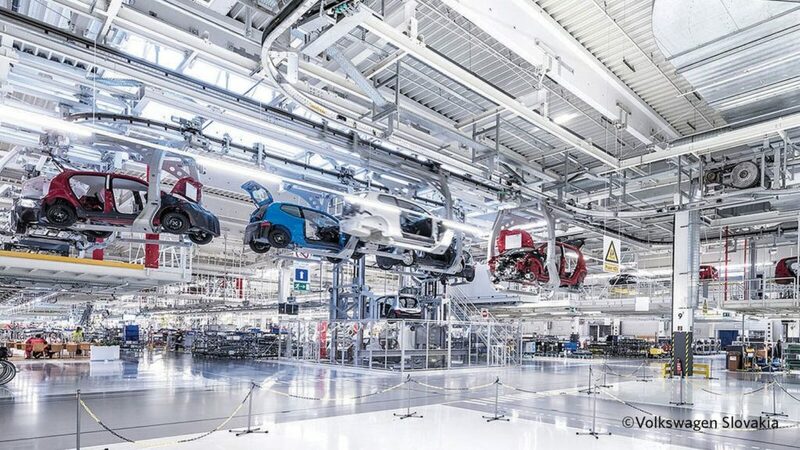 With a population of just 5.4 million people, Slovakia now has three car factories (Volkswagen, PSA concern and Kia) and is very soon to have four – investment by Jaguar Land Rover has already been approved with investment worth 1.4 billion to follow. Today the automotive industry directly or indirectly employs 250,000 Slovaks and represents 44% of total Slovak industrial production, with last year a great one for the Slovaks – more than a million cars rolled off their production belts. With the highest number of industrial robots united under one roof, VW SK factory operates as a car body shop for AudiQ7 SUV and it has the highest level of automation based on industry 4.0 principles. At the moment, another state-of-the-art body making facility which will be dedicated to Porsche Cayenne SUV is under construction in the VW Slovakia factory. Following progressive trends helped in transforming Slovak industrial sector into one of the best addresses in global automotive in just 25 years. With three operating original equipment manufacturer plants, fourth expected to start production within the coming two years and the innovative network of various suppliers the Slovak automotive industry belongs to the strongest destinations in not only manufacturing, but also continuously building its innovation force. Investors are opting for Slovakia because of the quick solutions they get in the field of administrative matters and bureaucracy, as well as for the quality of the workforce, which is educated and has a long industrial and automotive tradition. Even before the Second World War, Škoda vehicles, as well as tractors and tanks, were produced there. Moreover, Slovakia sits geographically in the region of Europe that is the heart of the European automotive industry. The VW factory near Bratislava is not just a facility for automotive production, but is also a unique and special venue for holding various events. Lovers of mobility and technology will be particularly delighted by it, due to its wide range of accompanying activities and the fully equipped conference rooms. The Volkswagen car factory in Bratislava is Slovakia’s largest and employs 12,300 people who work towards producing the following cars: Volkswagen Up!, ŠKODA Citigo, SEAT Mii and a number of SUVs – Volkswagen Touareg, Audi Q7 and car body for Porsche Cayenne. It all began back in 1991, when the company started producing the VW Passat Variant, followed by the production of the Golf III. In 1999 production of the VW Polo then came on board as well as parts for the different vehicles of the concern. A major turning point was in 2002, when the production of SUVs and the Volkswagen Touareg started up, and was then taken further in 2005 with the Audi Q7, leading to the summit of their production chain with the Porsche Cayenne, which has been produced there since 2010. 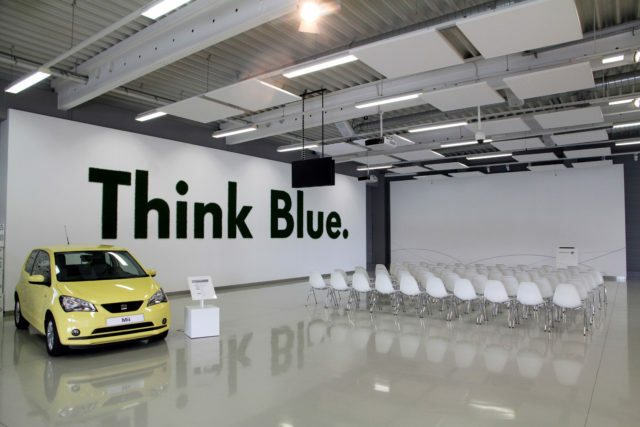 If you decide on the Volkswagen Slovakia factory as the venue for your event, then we highly recommend you to go for the tour of the factory, which functions as a city in miniature. Employees work there in different shifts and are marked out by departments and their shirt colours. A view of the production line reveals the complexity of the automotive business and the ubiquity of robots. A tour through the factory, which takes about two hours, starts out at the Auto Forum congress centre with a demonstration film about the history of the factory and plans for the future. The view of the 452m long cable car, by which the car is brought from production to the test line, is particularly captivating. The robotic vehicles that deliver different parts throughout the factory are also pretty impressive, as are the underground tunnels that interconnect all of the production facilities. The central event space is called Auto Forum congress centre, a flexible space of 680m2 that can accommodate up to 200 participants. As befits a car factory, it is technically equipped to a superior standard and offers the same sense of quality than you would expect from such a prestige car factory. An integral part of the experience is the exhibition with the presentation of the latest technologies. The factory’s latest acquisition is the Pulse conference venue, a modern and minimalistically designed building that includes two conference rooms and can accommodate up to 150 participants. The venue is also equipped with a 581m2 multifunctional space. 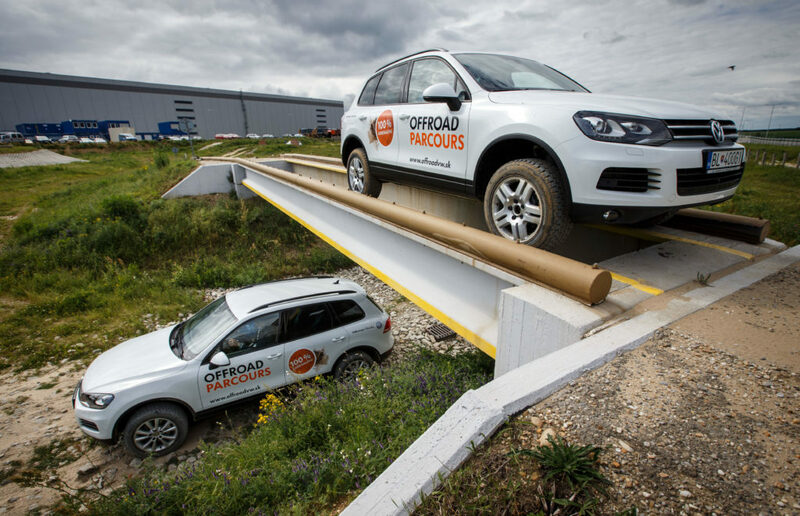 In Bratislava’s Volkswagen factory they are especially proud of their Touareg vehicle – they say that the car behaves like a refined sedan, but that at the same time it has its greatest moments when off-road. 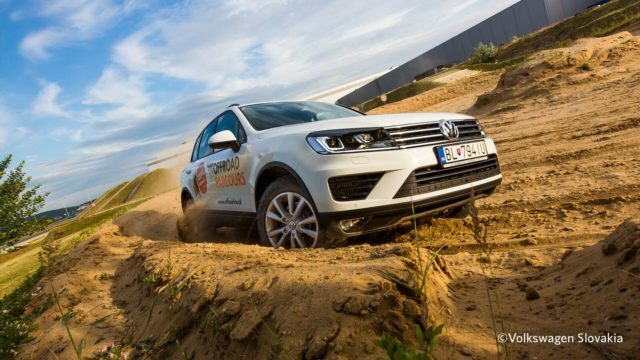 A test on the polygon specifically for off-road driving is a very special experience, as four-wheel driving comes to its finest and most specific level of expression. With the help of the instructors, you can overcome climbs on slopes of gradients up to 45 degrees and also test the vehicle on all kinds of off-road surfaces, such as water and sand barriers. The experience lasts 60 minutes and will take you through 24 special stages over a distance of 1.5km. E-Up is one of the greenest Volkswagen models. This little four-seater has managed to achieve a zero operational carbon footprint and can cover a full 150km on just a single charge. The car can cope perfectly with narrow streets, while also offering plenty of internal space. The first full e-vehicle can be personally tested – a one-hour ride through the city streets and on the highway will highlight all of the advantages of the mobile future that Volkswagen is betting on. The Volkswagen Slovakia plant in Bratislava is the only producer of five car brands under one roof. 2. The factory’s largest production hall is as big as 21 football pitches. 3. The SUV production line is 1.3 kilometres long. 4. The factory in Slovakia exports cars to 148 countries. 5. They provide 688 SUV body colour variations. 6. 700 employees in the factory deal specifically with quality on daily basis. 7. The conveying lift is 452m long. 8. The vehicle testing track is 2.8 km (1.5 miles) long. Eight different bases transport every vehicle that leaves the factory. 9. The Offroad Parcour length is 1,488m and includes 24 different off-road challenges. 10. The factory covers a total area of 1,780,058m2.